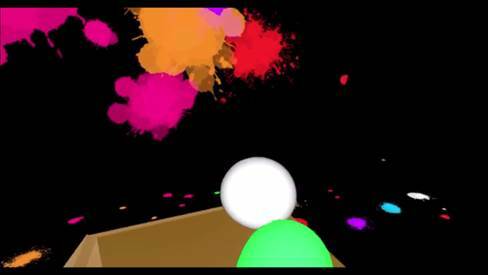 Description: Unboxed is a virtual reality game which is revolved around the idea of releasing and balancing control. Players are put into a room where they can smack away at the blobs that come out from the open boxes to experience a sense of true play as they release their instinct to control. As players release more control the game reacts to this prompting interesting changes to the environment and sound to promote a freeing, meditative, safe space to release all the stress from everyday life. Skills and Ideas Taught: The game promotes balance and it is adaptable to everyone’s different needs on balance. Players who are heavy on release will find they need to spend more time closing boxes to make it to the end (control), where players who are more type A (like myself) find that they need to consciously overcome this instinct to control and spend more time whacking the blobs to release and truly enjoy the space not just manage it. Goal or Challenge: The main goal is to completely become “Unboxed” by making it to the end of the game sequence. Player’s achieve this by balancing the two actions of closing boxes and whacking blobs into the environment to manage the play space and play environment. Assessment Approach: It mostly about if you make it all the way and learning through play that you do need to balance to have the full freeing experience.